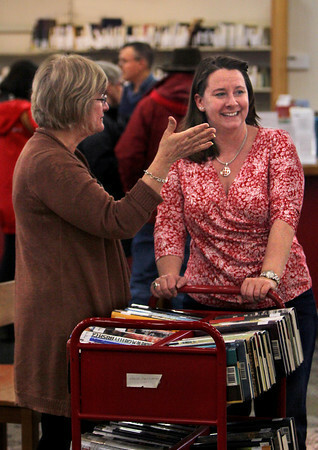 Ward 2 City Councilor Melissa Cox, right, listens as Carol Gray, director of the Sawyer Free Library, explains to her how to shelve books Friday. Cox lost a bet with Gloucester attorney Meredith Fine last fall when the two were competing in the Gloucester Rotary Club Trivia Night. Cox was competing with a team of city councilors and Fine was with a team of lawyers when the two made a side bet: if Fine lost, she would pull weeds and clean up Burnham's Field; if Cox lost, she would spend two hours at the library shelving books. Cox lost, and repaid her bet Friday afternoon.